ISLAMABAD, Pakistan (CNN) -- Pakistan's high court acquitted former prime minister Nawaz Sharif of hijacking charges Friday, paving the way for another run for office. Sharif, head of the Pakistan Muslim League-N political party, returned from exile in 2007. Attorney General Latif Khosa read a statement confirming the decision and congratulated Sharif, Express TV reported. A meeting between Sharif and Pakistani President Asif Ali Zardari will take place Friday at the Nawaz family residence in Lahore, presidential spokesman Farhat Ullah Babar told CNN. The Supreme Court banned Sharif from holding public office based on a criminal record dating back to the late 1990s. Sharif, then in his second stint as prime minister, refused to let an airliner carrying his dismissed military chief, Gen. Pervez Musharraf, and 200 other passengers land in Pakistan. Within hours, the army had deposed Sharif in a bloodless coup and the plane was allowed to touch down. Musharraf later went on to become Pakistan's president. An anti-terrorist court -- set up by Sharif to dispense swift justice -- convicted Sharif of hijacking and treason. He was sentenced to life in prison. Separately, Sharif was also convicted of corruption charges that year. The government struck a compromise, allowing him to go into exile in Saudi Arabia under the condition that he stayed out of politics for 10 years. 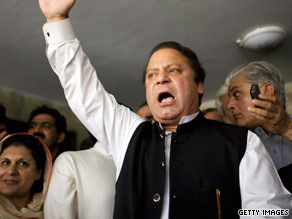 Sharif, head of the Pakistan Muslim League-N political party, returned to his homeland in November 2007. The Supreme Court overturned the public office ban on Sharif earlier this year. The acquittal on criminal charges clears the slate for Sharif.